Visual: Black. Still. Thin dash of a gray head. Nose: Liquorice. Toasted teacakes. Vanilla. Body: Treacle. Marshmallow. Maple syrup. Very thick. Toasted teacakes. Vanilla. Light butterscotch. Fudge. Chocolate liqueur. Finish: Maple syrup. Liquorice and blackcurrant hard sweets. Chocolate liqueur. Vanilla. Molasses. Light charring. Bitter chocolate. Conclusion: Ok, between this and the Barley Wine I had recently Lervig are really wooing me back into the fold. Why did I ever doubt them? I have to admit the first impressions weren’t in its favour. While it had lovely toasted notes in the aroma they were matched and quickly overcome by masses of liquorice. As I think has been established over the years, I don’t mind liquorice in moderation, but I think when it is overused it can ruin a beer. The finish bring in the heaver contrasting notes. The liquorice comes back, tied now to blackcurrant notes in a hard sweet like fashion that keeps in manageable. There is a light charring and sweeter notes that slowly fade out into bitter cocoa. That bitterness is just what is needed to keep such a heavy sweet beer manageable. This has a very distinctive feel – half way between toasted marshmallows and toasted teacakes in a super thick beer. It has a distinctive flavor as well with the maple syrup very evident while not being too dominant. It is distinctly rewarding with huge complexity and manages to feel barrel aged but without the drawbacks. Background: Grabbed this a while back – basically saw the words “toasted” and “maple syrup”, followed by “Imperial Stout”, and grabbed it. Since I grabbed it I started becoming less enamoured with Lervig, then back totally into them again. I have been very changeable recently. 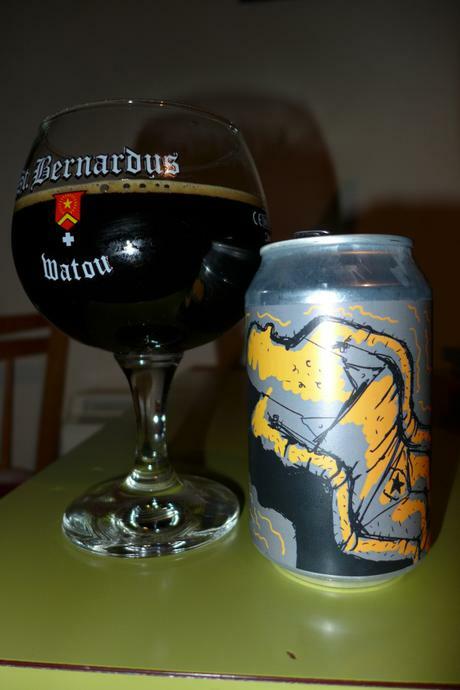 Anyway, another one grabbed from Independent Spirit – not sure what is going on with the can image – looks kind of like what would happen if Mr Fantastic from the Fantastic Four burnt to death. Don’t think that was the intended imagery. Anyway, put on The Germs’ MIA compilation CD. Really stripped down punk that I got into after hearing they were an influence on Bad Religion. Pretty fun, if kind of rough sounding.